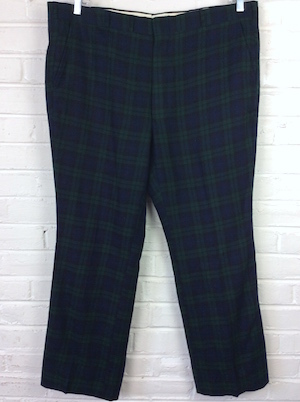 BIG MAN Vintage 1970s wool disco pants! 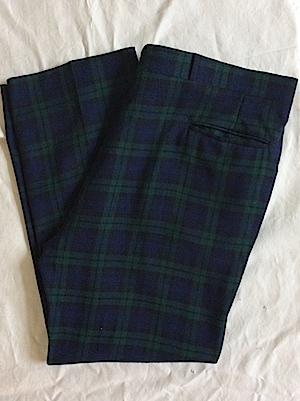 Wonderful classic navy, green and black tartan plaid, wool pants. Closes in the front with a hidden tab closure and hidden interior button for a more secure fit. 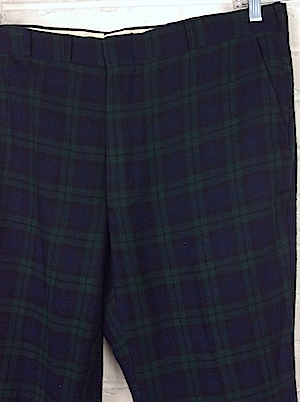 Two pockets in the front and two interior pockets in the back, one with a button closure. Pants are not lined. No material tag, but feels like 100% wool. Condition: Good++: Has a small rip in the upper right pant leg. The rip has not become completely pulled apart, so it can be easily repaired. Still a great pair of disco pants. Priced accordingly.